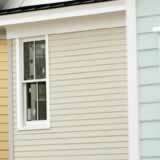 Home | Vinyl Siding How-To | Repairing Siding | Can roofers replace rotted fascia trim? One of the largest home improvement projects is the installation of a new roof. Because of the size and difficulty of a roofing project, most homeowners hire a specialized roofing contractor to do the work. As part of the job, a roofer might remove the old shingles and inspect the underlying roof structure for damage before installing the new shingles. A common source of damage is the fascia trim--also called fascia board or simply fascia--the vertical finish piece installed on the rafter ends. In addition to giving the roof a finished look, the fascia trim also protects the home's interior from the elements and serves as a mounting point for the gutters. Unfortunately, it is fairly common for moisture trapped between the fascia and the gutters to cause damage that requires replacing the fascia. Most roofers should be able to replace rotted wooden fascia board with new wooden fascia board. In fact this work may be included in the original quote if the fascia damage was discovered before work started. Even if the damage was not discovered until the project was underway, installing new wooden fascia is relatively straightforward and your roofer should be able to do the work for a reasonable price. Besides wooden fascia, other options include aluminum, fiber cement board and vinyl fascia. If you want to use one of these materials instead, you may need to hire another contractor, as not all roofers are familiar with these alternative materials. If your roofer cannot do the job, look into hiring either a general contractor or a specialized siding contractor. Make sure the damaged fascia will be replaced and not just covered with aluminum or vinyl. It does no good structurally to cover rotted fascia. The price for fascia replacement varies depending on the material used. In general, expect to pay $1.50 to $2.50 for 3 linear feet of vinyl or aluminum fascia and $2 to $5 per linear foot for unpainted wooden fascia board. You may need to pay additional costs if you want your fascia painted or if scaffolding is needed to do the work.